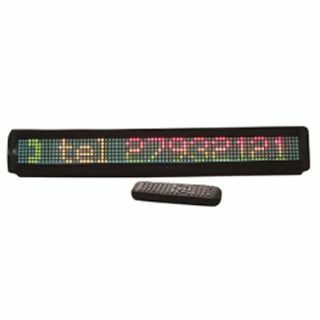 Tri colour single line moving message board with remote control. The product features 13 characters, 10 colours with rainbow effects, 24 display/transition methods, 8 speeds, built in animations, create custom logos and graphics, programmable audio output, RS232 serial interface, real time clock, time and date display mode, 100 messages with a total of 7000 characters and battery back up for the memory. Supplied in a rugged aluminium enclosure.